The Maharashtra Government and the Indian Railways have announced the completion of over half of the work necessary for creating a world-class railway terminal in Panvel. The announcement underscores the shift in center-point Mumbai which is expected to be in Panvel. The announcement will have a progressive impact on Panvel as an emerging preferred realty destination factoring the boost in connectivity. The evolution of any urban conglomeration into a vibrant global city is a gradual process, one that begins with planned development, robust infrastructure and improved connectivity. The announcement of Panvel railway station as a rail terminal will augment the location preference quotient. From just being a sleepy town situated at the Tri-junction of roads that connect Mumbai, Goa, and Pune, Panvel is fast morphing into the ‘central location’ in the MMR, and with planned infrastructure–including the railway terminal – all set, this will enhance transport linkages to become the choice real estate hot-spot. To resonate with why the new rail terminal will further foster the growth of Location ‘Panvel’ begins with its linkage to the Navi Mumbai International Airport, goes on through the Mumbai trans-harbour link to the new suburban rail corridors that will connect Panvel and Navi Mumbai to existing railway hubs. The state government has extended support to convert Panvel from just a terminus for harbor line trains from Mumbai CSMT into a much bigger station. This represents the growth potential of Raigad district, which is gradually upgrading, with Alibaug being seen as one beneficiary of this rail linkage. The ‘future-proof’ rail network is being created, and in this, Panvel as a railway terminal will play an important role. It dove-tails with permission for fast lane CSMT-Panvel elevated rail corridor having been granted. The elevated corridor has the potential to enhance connectivity in addition to the speed in linking Panvel with Mumbai’s CBDs. 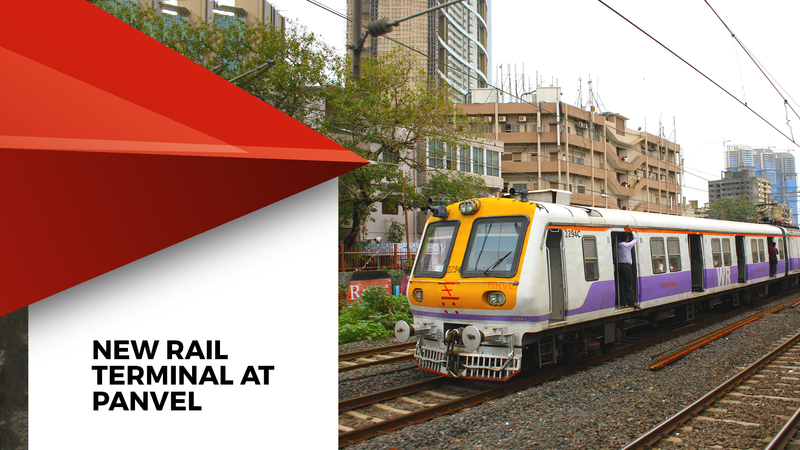 Panvel will be linked with CSMT in a time-span of just 50 minutes once the elevated tracks become operational. Panvel evolving into a terminal meant it would reduce the load from CSMT, Kurla LTT and Dadar—because the human resources that power Mumbai will largely be shifting to Panvel and such new evolving hubs. Ideally located on the Mumbai – Pune IT corridor, Panvel is fast emerging as the favorable Commercial hub amongst many Indian BFSI, IT and ITeS & MNC companies. It offers residential options which are ideal homes for those having an aspiration-based lifestyle. Among the fastest growing regions within the Mumbai- MMR conglomeration, the Panvel real estate market has been growing in sync with the slew of mega developments in Navi Mumbai. Dr. Niranjan Hiranandani, National President, NAREDCO opines that “Looking at the future, the new linkages and connectivity will ensure the region ‘takes-off’ as regards further economic growth centre and development hub. Given the advantage of being located between two IT and ITeS hubs, Mumbai and Pune, Panvel is evolving into the ‘next big happening location’ in MMR real estate. It is positioned just right, as it offers the right mix of residential and commercial development features”. The potential of planned connectivity linkages is immense – take the railway junction which links Mumbai, Thane as also the Konkan Railway, with Panvel-Karjat passenger line opening up a closer route to Pune and beyond. Planned transport linkages include metro and railway inter-connectivity, and by the looks of it, Panvel, is all set to be the new railway center-point for Mumbai and the MMR. When it comes to making a smart decision in terms of real estate, those who spot the potential of Panvel as an emerging location in present-day will be making the right choice, at the right time.